Bulgarian capital city Sofia launched a night bus service on an experimental basis on the night of April 7 2018. On four routes in the city, buses will run from midnight until 4am. The experiment of providing the service is set to continue until December 31. While a single public transport ticket in Sofia costs 1.60 leva, the night bus ticket costs two leva and is sold only by conductors on the buses, not by the driver nor via machines or other public transport ticket sale points. Each bus has video surveillance, as well as a panic button for drivers and conductors. According to Sofia municipality, the four bus routes link all the residential areas of the city. 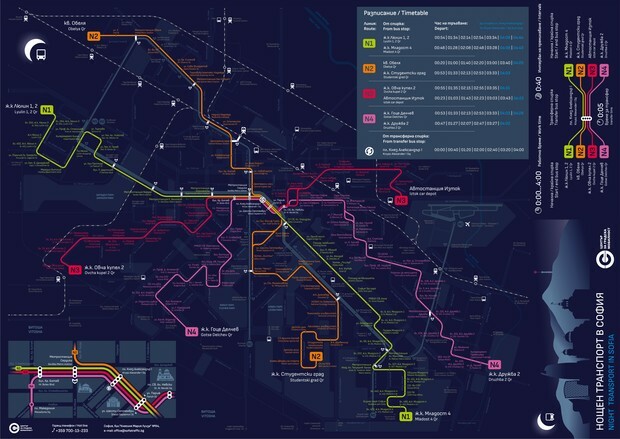 Full details of the routes, in English, are on the website of Sofia’s Urban Mobility Centre.